English title: Public Relations -PR. Theory and Practice. This monograph looks at the place occupied by PR in modern communicative processes, following the main theoretical stands and essential expressions of flow in practice. “What is this thing called PR and what can it do to us – the general public?” – is the main motive of this book. This work does not focus on the “how-to-do”, or practical applications, or a listing thereof, of the concept of PR, but rather examines the concept of PR on a much wider scale, employing an exploratory cross-sectional approach. 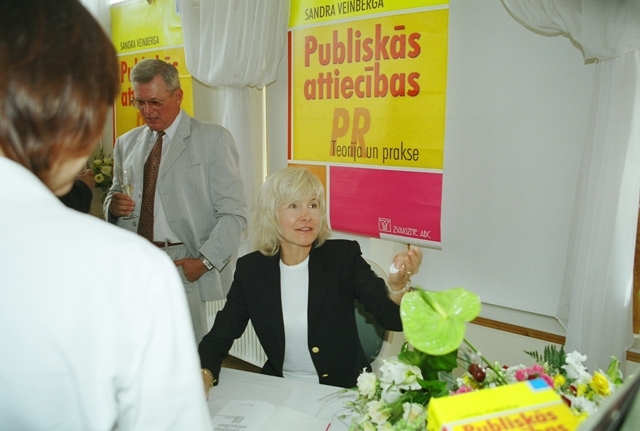 Initially encountering PR formulations and explanations in the English, German, and Latvian languages, it has been concluded that none of the currently employed concepts, including the magical abbreviation “PR”, satisfy the majority of researchers, or reflect the essence of the object under scrutiny, if we wish to examine public relations in as wide a spectrum as possible. Among research specialists (British, American, German, Austrian), there is no unity regarding a singular interpretation of the history of the development of PR, it’s place and role within the process of social development, and other questions, which, all totaled, testifies to the somewhat delayed development of PR as an interdisciplinary science. At the same time, significant questions within this specific sphere have become very topical within the past few years, and the growing number of scientific works dedicated to public relations verifies that this particular field is growing in significance not only in Western Europe, but in Eastern Europe and Asia as well. Photo: Sandra Veinberg presents the monograph Public Relations. Theory and Practice. Looking at things from the historical perspective, one may conclude that the development of PR has flowed in two distinct directions up until now. The first is the tradition established in the USA; the second- the European, or continental school, which is represented by the Germans. The first school is more familiar, and wide-spread, whereas the second is, in comparison, much older and, from an academic point of view, offers a very solid and interesting theoretical foundation of stands, which has been, until recently, analyzed much less within the wider scope of scientific PR forums. Beginning with the positions reflected by the various formulations of PR in various languages, one could conclude the differences between the continental and Atlantic stands regarding the interpretation of the term itself. If, in the European countries main direction is one of “focusing on impact relationships in an environment of openness” (Nielsen, Femo, 2000), then in American research, the “social environment” is only a part of the general public, without any visible prevalence in the practice of public relations. 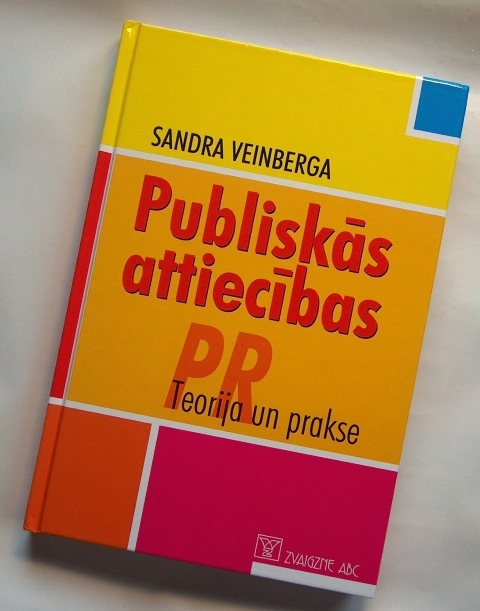 The concept of PR, just like all other imported concepts, has, with no small amount of difficulty, been assimilated not only into French, German, and Swedish practical and research literature, but into the Latvian as well. No one of the “localized” findings actually justifies our hopes, and thus, even in the non-English languages, the English calque “PR” inescapably dominates this particular field. Photo: Ģirts Salmgriezis (radio SWH), Arnis Krauze (Latvian TV), Sandra Veinberg. The translation of the concept of PR does not contain within itself only the practical difficulty of proper explanation. Adaptation into the local languages is, to a large degree, hindered by the negative connotations associated with the term, due to the fact that up until now, PR has generally been associated with practices such as “ugly maneuvers used for attracting and fooling people with the intention of reaching a specific goal in the expression of opinions” (Larsåke Larsson, PR på svenska, 2002). Asymmetrical communication has, both in the past, as well as in the present, been the dominant and most widely employed method within the practice of PR. Thus, discrepancies, inconsistencies, criticism, and a rather sharp exchange of opinions accompany the development of PR on the levels of both practice and theory. The next problem faced by the field of PR is the development of both theory and practice within the demarcation lines of the interdisciplinary sciences; “standing with one foot on each side of the river” – namely- within either the field of marketing, or of communications. The appearance of public relations begins with the history of PR in the USA, from the moment when Edward Bernay decided to seriously focus on the mission of public relations in his work, attempting to choose one of several possible directions; would it be the prevention of stress in society acting in the name of the social interests of the general public, or, on the other hand, a desire to regulate the opinions and actions of one’s fellow citizens in a direction favorable to oneself? He decided to lean towards transmissive communication and, to a certain degree, all the American PR classics are now following his example. The Swedes and the Germans have also turned to questions of the dislocation of the field, emphasizing the fact that current PR theory discoveries demonstrate a certain distancing from the scientific context of media and communications sciences, and a certain independence from the presence of other, neighboring scientific ideas. Aside from the afore mentioned, an expansive area of development has been observed up until now regarding the solving of practical issues. J. Falkheimer notes that the major problem plaguing the science of PR is the fact that the science of public relations still does not possess any new and fascinating scientific theories, the kind that “as opposed to ensuring the delivery of simplified forms, but rather opens wider the perspective of development and the area of knowledge, increasingly ensuring opportunities for in-depth probing, and not just surface education”. Postmodernism, poststructuralism, culture, and belated modernity are still not among the current context of scientific research within the field of PR that actually could be desired. Historically, the first PR formulas define the new phenomenon as a strategic communications technique, the practice of which would ensure various forms of proposals and interpretations. Undoubtedly, public relations have, since the moment of its inception, been regarded as a rational management instrument. However, in PR, as opposed to marketing, it was not the client that was given priority. The main focus was turned on the mass media, on fellow citizens, on personnel, on the local society, on investors, on social and political movements, and so forth. The 20th century was noteworthy due to the massive communications boom it experienced, that materialized not only as an increase in the volume and scope of the flow of information, but in the technologization of the flow of information, and the employment of all the new communicative systems for the creation of ideologies for these processes. The fascist German, and the Soviet dictatorships, are only the most obvious (but certainly not the only) examples that, to a large degree, compromised the various expressions of PR. The modern public relations environment still methodologically and circularly returns to the foundational explanations of PR, never ceasing in its attempts to make certain whether PR is, in fact, a bond with society, or a form of manipulation of the aforementioned. These questions are especially topical now, under the new circumstances of globalization, wherein the old forms of manufacture in factories have been replaced by a high-tech society oriented towards service. Digital communication has rearranged communication in a cardinal manner. Computerization has melted the industrial society into a service environment, and communicative insatiability as a form of human relations interactionism, still functions as the fuel for the evolution of society. All the previous periods of history are witnesses to the various attempts at communication and the human desire to make known news of oneself to others. Beginning with the oldest known message discovered up until now, which is to be found in the Chauvet cave in France, and ending with the anonymous modern-day “chat” at Internet forum sites, we see that the desire of the party conveying the message, whether it be an ancient message or series of scratches on a cave wall, a message inside a tunnel, on a church wall, an auditorium wall, a hallway, on the backs of museum chairs, on shelves, vases, and other public places, has always been to ensure that a maximally large number of recipients receive the message. The more provocative and visible the area on which the message “I, John, was here before you!”, the greater the possibility that this text will be read by a maximally large number of individuals. Man has long since felt a drive for global conversation with others, even extending outside the boundaries of one’s own time and specific period of civilization. Thus, the foundation of mass communication is not just progress pressure dictated by technological progress, but rather an ancient human desire to converse with large numbers of unknown individuals. However, it is said that only that form of communication, that satisfies both sides, is effective, i.e. mutual, or two-sided, communication. To a large degree, communicative comfort has dictated the dynamics of social development. Stiff and formal relationships, with countless “taboo’s” and restrictions, are a sure sign of social regression. For example, totalitarianism is one of the best examples of communicative relations disorders to be found within society, which was clearly demonstrated by the USSR – a nation, that was “placed inside a hermetically sealed tin can and based upon bayonets” (a Russian poet’s formulation, ca. 1987). Here, not only were communicative contacts with the outside world being politically arrested, but they were to be found within the infrastructure of the state, and all the other satellite states’ systems as well. In the circumstances prevalent within the communist dictatorship, only a semi-officially regimented and ideologically coded flow of information was operational, that was in complete lack of any logical message coding whatsoever. A situation in which it is undesirable to voice one’s opinion “on all matters”, and “there are themes”, the discussion of which may result in one’s arrest or transportation to a Gulag forced labor camp in Siberia, realistically resulted in a significant weakening of constructive communicative abilities within the people living in this nation that was ruled via a dictatorship. This theme is a very fruitful project for future analysis, because it signalizes the fact that a deformation of communicative skills can be a very real and significant hindrance to integration. After the collapse of the USSR, for example, it was specifically the inability to practically apply the logical communicative message code on a daily basis that hindered the entire process of moving towards the western world. These barriers could be observed not only with contacts with foreign countries, but also within the chronic defects of interior communication, that were dominated by the crippled practice of using analogies and symbols, as well as a constant “beating around the bush”, avoiding any concreteness, and a refusal to label things/persons/processes/events for what they really were. A similar situation has developed within those societies, that are either still under totalitarian regimes, or that have just recently been freed from such regimes. Up until now, communication has gone through four distinct info-technological revolutions that have significantly altered the genetics of communication. Verbalization (spoken language), permanentation (written language), mass scale (mass scale prevalence), and digitalization (digital IT). From this point then, the mediation process results, that forms the symbolic valorization of the manufacture of goods, and thus, media diffidence can be established. The last is a unique media effect that comes into being if, within the structured flow of the various forms of media, the recipient has no possible opportunity for relevant participation. The difference between communication (a two-way, mutual bond) and media communication (a one-way, transmissive form of communication, with a very conditional mutual bond), is what creates that specific form of timidity (diffidence) of results within the work of the media that is being compensated today by ratings, or viewer numbers and figures, and that is being widely employed by PR as an essential marketing instrument. Unfortunately, ratings are only a conditional gauge for measuring audience reaction, and can not be classified as being the serious landmark as which it still currently serves. Ratings results, just like public opinion polls, are approximate and ruled by the situation at hand. Owing to digitalization, “the recipient becomes a partner in the dialogue” (Ch.Sturmark, U.Branden, 2001). The new paradigm significantly differs from the former, because a conditional form of digital dialogue has supplemented the contact between the mass media and the public with the audience. In researching PR, the communicative environment should receive a great deal of attention, because it is the very foundation of public relations as such. The levels of media development as well as the level of openness within a society are significant and relevant factors within the development of PR. Both of these factors are mutually connected, and, if one is eliminated, then no form of developed PR can be realized. Within any concrete period, the dominant form of communication in use has dictated the profile of PR, its place within a society, its models, its genres, and its responsibility in the face of society. This aspect must be respected in examining the development of PR, which is actually a completely different scale of periodization, regulated by the progress of means of communication as such, and not by the evolution of historical social relations (such as the dominant PR historical periodization factor was up until the present time). The position does, to a certain degree, coincide with the conception held by Marshall McLuhan. The needs of communicative techniques (which develop exponentially), and societies (which develop gradually), are moving closer to one another, but PR is unable to function, if a truly democratic environment in which there is freedom of the press is not created and maintained. Taking into account the fact that the present-digital communications development stage preserves the former medial communications tradition of the symbolic manufacture of goods that is dominated by the principle of commercial advantage, PR will also have to include the valorization process in its operations, precisely in the same way that the media modifies it. Thus, one of the conditions necessary for the successful functioning of PR is an understanding of the media’s principles of form modification. In order to understand the aforementioned, one must turn to an analysis of the effects of media evolution, without which no real understanding of public relations practices is even possible. The next topic in the monograph, that has been looked at rather extensively is the problems being faced by the science of PR regarding its development; the situation in this sphere is not at all insignificant, and is such, that not only within the circles of practical PR, but within the academic circles as well, the branch of science referred to as Public Relations can not seem to pull itself away from the label of an “immature science”. Reasons for this label, and how it came to be applied to this particular science, are still being examined, and, in this process, one can not help but come to pretty much the same conclusions as Ravez, Judy Von Slyke, Grunig, Ruhr, and Signitzer regarding the ever growing conflict between the traditional sciences and the scientific principles of the interdisciplinary fields of research. The monograph examines the most significant scientific discoveries in the field of PR, beginning with James Grunig’s models, and concluding with an overview of other theories, focusing on both parts of the formulation, i.e., “the public”, and “relations”. Here, special attention is devoted first of all to “the public” and “public space”, in which the forming of bonds with the public actually takes place, attempting to come to clarity on whether or not the practice of PR is the teaching or education of society, or, if it is, in fact, a form of dialogue; the concepts of “masses”, “crowds”, “target groups”, and “audiences” are also clarified, via explaining the principle of round-table talks as the cornerstone of modern PR, following up on relations strategy as a complex, and, at the moment, insufficiently researched process. 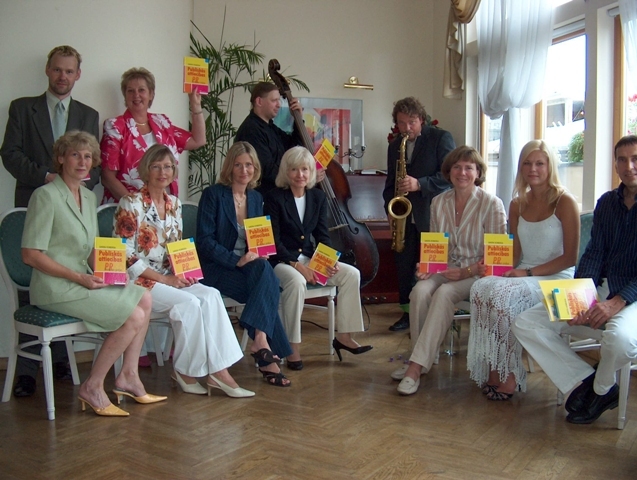 The chapter dedicated to communication examines not only the essence of the communication process, but the stipulations and scientific models associated with it, including the context and effects of communication, also taking into account the various manifestations of propaganda, including the bonds between power and action as pertains to mass communication processes. The employment of the media in communicative processes, as well as the specifics of the functioning of these processes is also covered rather extensively. Interior PR is examined as one of the major processes of practical PR, looking at the most widely accepted “interior organization” methods and trends within the science of PR. A separate chapter has been dedicated to problems in relations, paying attention first of all to pseudo-events as one of the most common PR activity “hooks”, and looking also at the issue of boundaries of fact interpretation. A separate discussion is included on the subject of “rejection of media and PR”, as well as on the relationship between PR and politics, industry and producers, organizations, and other non-governmental groups. Opportunities for influencing public opinion, as well as published and public opinion, are topics that attract formation mechanisms of stereotypes, opinions, and stands, image structure, and content, as well as the realization that it is not possible to form a constructive image via the use of PR methods in the absence of certain conditions. The tenth chapter of the book is dedicated to PR strategy models, risk communication, and ethics. Today, risk is not only a question of technical or economic expertise; it tends to be communicable, able to be withstood, or not able to be withstood, acceptable, or unacceptable, definable, or non-definable risk. It all depends upon the abilities of the party sending the information to perceive the situation and upon the profile as well (specific interests are being served). Ethics within the field of PR is a widely discussed issue, and a very important issue at that, because it is a factor that retains the ability to regulate society. In much, the same way as infant mortality; the level of ethical standards within PR in a given country is an essential indicator of that state’s overall levels of development. Ethical issues are closely tied with the every-day practice of PR. They include the entire process of public relations, beginning with strategy, and ending with specific tactics. The final chapter of the book turns its attention to issues concerning PR practices which I have been faced with while lecturing. Among the subjects discussed, will be topics such as the unique elements of PR and their expressions, PR planning, and the scale of all the various genres of PR. Also examined will be issues concerning the evaluation of public relations work. Bad methods and an analysis of problems, troubles with media whims and fancies, as well as the rules of the game are all current topics that are regularly brought up in seminars and in PR lecture courses. Problems of media understandability are also examined including redundancies, entropies, and the temptation conditions of stereotypes and negative information. Focusing on the mastery of current events in the news, understanding the course of interviews in the press, on the radio, and on TV, and also examining the analysis of crisis situations, are also included here. Sponsoring and the media, is a subject that I have examined here only in a passing way, focusing only on the newest trends in this particular field. Finally, I have examined the most recent of the modern trends of development in PR, including the “seven steps” within the modern direction of PR, and an analysis of “the digital journalist”; finally, the demise of embargo PR is examined.